Hi Redtags! Well, I have gotten a lot of Christmas Newsletters this year. Here we go. 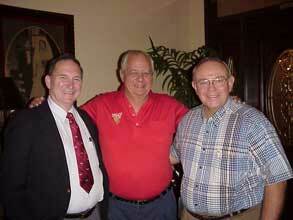 From Fran & Dave LEE, comes word that Dave retired from U of Dayton but continues as a part-time professor. He enjoys time for hunting, flying and travelling. They built a new house which has kept Fran busy with decorating. Daughter, Kelly, became Principal of the 2nd largest Elem. school in her area. She found out she was pregnant a short time later. Is there a cause and effect relationship there? Her husband, Dean, is finishing his sabbatical with the City of Dayton Alliance and returning to Lexis Nexis. David II is managing an apartment complex in Dayton. Son, John, is trading equities in Orlando while playing on the 20 golf courses in the area. The San Diego group had a Tail Gate at the USAFA- San Diego State game. 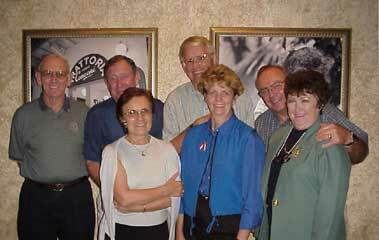 Stan Patrie sent me a picture of the gang. See attached picture. 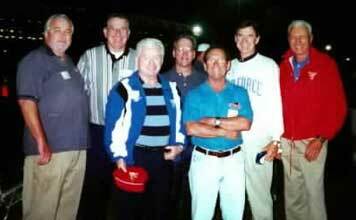 From L-R; Jim Whitted, Willy Holbrow, Stan Patrie, Charlie Hale, Lary Harmon, Mike Quinton & Bob Connolly. Got a letter form Judy (Daryl Wood) who retired with a disability on January 1. Shes an associate member of the AOG now. She went to a memorial service in October for all grads who passed away in 2000. She says it was emotional but helpful. And shell be at the 40th reunion. Got a letter from Charlie and Mary Jo Price in Atlanta. They have settled into their new house in Atlanta. Mary Jo is semi-retired from golf and enjoying bridge and a cooking group. She shied away from a shopping group because they would only slow her down at the malls. Charlie doesnt have much time for golf but managed to be on 2 winning teams, including a PGA Super Seniors Pro-Am Team. They attended the reunion of their old 525 Tactical Fighter Sq. from Bitburg. They also went to a family wedding and reunion. They are mastering those five lane highways in Atlanta. Hope to see you at the 40th reunion. Bob and Bobbie Gibson provide the Marine perspective. He had good words for Don Shepperds analyses on CNN and Dons words about the "Grunt" side of the operations. Bob is working with recent USAFA grads who look at him like hes a T-Rex from prehistoric USAFA history. His son, Rob, is going through the Ratline in his first year at VMI. Son, Steve, is a sophomore in high school and lettering in football, wrestling, swimming and crew. They are looking forward to the 40th Reunion. Owen and Connie Hawkins have been on the move again this year. They went to Zambia to see a Solar Eclipse. (One of my friends in Toastmasters hunts down solar eclipses for a hobby. He sailed out of Zanzibar to see the one in Africa. Maybe they know each other.) The Hawkins also saw son, Cory, take Jamey Wilson for his wife. 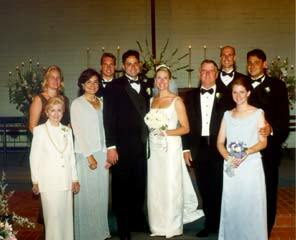 See the enclosed picture showing the family. Connie enjoyed her 40th high school reunion. Owen has retired and is doing things around the house now. And he keeps the Redtag Nets alive and hopping for us. Thanks for all you do for the class, Owen. Heard from Gail & Peggy Peck. Gails Dad has been in the hospital a few times this year but is OK now and celebrated being 86 years old. Son, Skot, has a new wife. Jack has a new home in London for wife and three kids. Daughter, Kayte, with Kaipo and Kanani headed to Hawaii for the holidays. Jen quit her job with Apple and came home for a job at UNLV. Liz is in the middle of her junior year at UNLV. Gail and Peggy have been using the plane to fly around the Southwest and enjoying it. Peggy is finishing another chemo series and is doing well. Our wishes for a good 2002. From Larry and Penny Gooch comes this news. They are settled in their new home in Santa Maria, CA. Larry is the Chief Technical Officer for the California Space Authority. Penny has seen old friends and found new interests to stay occupied. High on both of their priority lists are frequent visits to the grand kids and twice a year gatherings at their home. Daughter, Jennifer, is still with Dell Computer in Round Rock, TX., and Jeff is still with Sears. Daughter, Winnie, with Dannie and two kids are about to head to London for a six-month temporary assignment. Daughter, Laura, David and two kids are moving. Laura & David have accepted positions at a social services company in Sacramento where they administer a foster childrens program. See you at the 40th. While I was at a Safety Institute in Las Vegas in October, the local Redtags had a get together. In attendance were Bob and Georgie Deberry, Gail & Peggy Peck, me, Paul Robinson, and Bobbi Altman. See attached photos. Got a missive from Charlie & Pat Hale. They had the house tented for termites. They figure the termites sneaked in during a wild party. They attended a reunion of the old 306th Bomb Wing in Melbourne but there was no time for us to get together. They did get to visit the old unit facilities at McCoy Field in Orlando. Son, Curt, is still in San Bernadino with TGIFridays and wife, Bridgitte, is still at Best Buy. Son, Charles, is still fighting Menieres Condition. We hope he does well in 2002. Pat still does her quilting and Charlie still works for the March Community Credit Union. Their house remodeling resulted in a larger guest room. So stop in if you are in the area.. They look forward to the 40th reunion. Tom and Virginia Moore sent a three-page newsletter with several pictures. See enclosed picture with Tom flanked by son, James (L), son-in-law Maurice (R) and four grandsons. Daughter, Elizabeth transferred to Toronto where she heads the Admin activities of the US Consul General. Son, James, a Marine Pilot, continues to fly the Presidents helicopters. Katharine, Maurice and the kids moved into a new house in Ashburn, VA. After Tom recovered from his 60th birthday, he and Virginia went on a 38-day, round-the-world trip. Would you believe that Tom went to Australia to ride a hot air balloon and a camel?...not simultaneously. They did some other travelling during the year but planned on a holiday at home with the family and a trip later on to the 40th reunion..
We had a mini-reunion here on the Space Coast two weeks ago. Duke and Monika Green were in the area looking at prospects for a new location. So we got together for dinner. In attendance were Duke and Monika, of course, Willie Gray, Mike and Kay Butchko and Caroline and I. See the attached picture. Bill and Sue Haugen sent a newsletter. Bill retired from Boeing for good after 12 years. They built a new house in the Washington, DC area and stayed with Chet and Eva Lee Griffin while the house was being built. Daughter , Cindy, had a second baby. Linda and Caise have two children in nearby Sterling, VA. Stephanie and Michael have moved to Manhattan for his Boston Consulting Group job. And Stephanie is now a Veterinarian. And we look forward to seeing them at the 40th reunion.. I also heard from Gary Baughman and Jeannie Wager, DBA "The Baughman Family" (a loving relationship). See attached picture. They are eagerly awaiting the mixed doubles tennis season beginning in January. Garys Senior Mens 3.5 UTSA team won the Atlanta City Championship for the 5th time this autumn. They play in the state tournament in May. His team has been the Georgia State Champions four times and has been third in the SE Regionals. Gary is mentoring advanced science students at two local middle schools and written a book on how to design, build and fly indoor rubber-powered models for science competition. One of his models has flown over 11 minutes on a skinny loop of rubber. (Take note of that, Chuck Cheeseman.) Hope to see you both at the 40th Reunion. Got a card from Willie and Nancy Gray from across the river in Melbourne. Willie still works part time for Lockheed-Martin and as a consultant for Bechtel on the Nellis AFB Range proposal. That job should be completed by April and then he will retire for good. OH sure! And Ill be a Rock & Roll Superstar next year. Nancy tried to retire this year and only lasted one week. Forget it Willie and Nancy. Its not in your genes. They went on a cruise to Alaska with their old unit from Hawaii. Son, Larry, is still in Atlanta at the "Front Page News Restaurant. Daughter, Christine, accepted a position at the University of Kansas Medical Center in Kansas City as a Clinical Psychologist. And I feel certain well see them at the 40th. 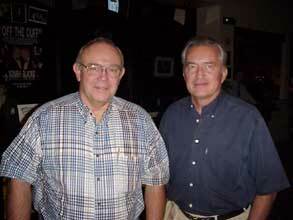 And finally, there was a mini-reunion in the Dallas-Ft worth area in September. Jerry Smith helped organize the events. 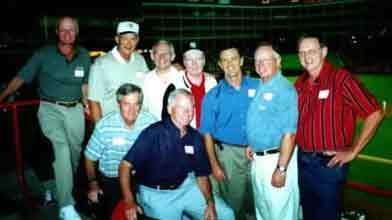 They feasted at a Friday dinner in Ft Worth, bogeyed through a Saturday morning golf game at Bear Creek, and sopped up a Major League Baseball game at the ball park. See attached pictures. I guess thats all for now. It will be two months before we launch another Shuttle It will be another year to think about retirement. Hope that more of you come through Satellite Beach this coming year. If not, Ill be looking for you at the 40th Reunion. Go Redtags!